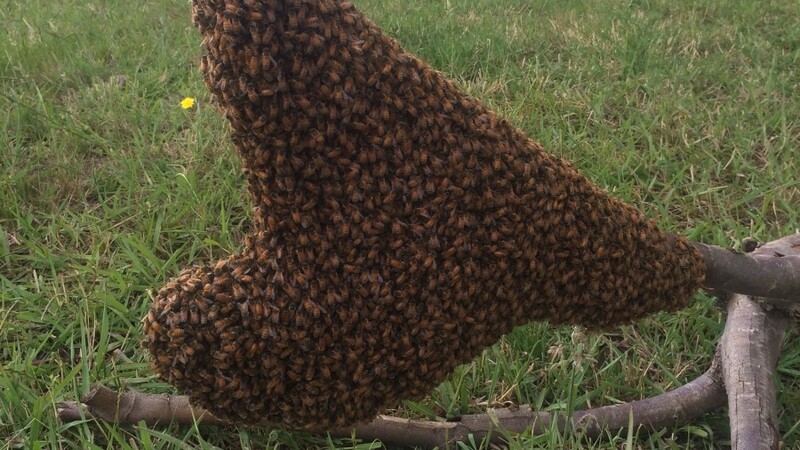 Have you seen bees swarming? Swarming is a bee colonies natural way of increasing and dividing its population. The old queen will lay a new queen cell and just before this new queen is about to hatch the old queen will leave the hive with half the population of worker bees and fly off to look for a new hive. A swarm of bees will hand in a tree, on a fence or anywhere else it chooses while scout bees are off looking for a new place to reside. When a place is found these scout bees will return to the hanging swarm and the whole swarm will take to flight again and move to its new location. Bees are at their most docile whilst they are in a swarm formation. They have no brood to protect and they have filled their bellies with honey in preparation for flight. If you see a swarm and are not a beekeeper the best course of action is to phone 0800 MELITA. We can send someone around to collect the bees and give them a safe home. Don’t call pest control for obvious reasons. If you leave them alone the swarm will eventfully take flight and leave on their own accord. The only issue then is that they could take up residence in the wall linings of a house or under someone’s BBQ hood which then becomes a little more problematic.